Since the Stone Age humans have adorned themselves using colour, initially during rituals and later for decorative effect. By the time of the ancient civilisations of the Near/Middle East and adjacent Mediterranean region, sophisticated personal grooming practices and widespread use of beauty aids were well established. Early face paints were mineral pigments ground into powder, certain preparations being used to shade and outline the eyes. At Ur (in today’s southern Iraq) Sumerian eye cosmetics were buried with the dead c.2500 BC: cockleshell containers held multi-coloured pigments including purple, blue, green and black. These closely resembled substances found in ancient Egypt (c.3100- 332 BC) and elsewhere: copper compounds produced greens and blues and galena – a dark grey ore – created kohl. Mixed with water or oil, the paste was applied to the eyes with a finger or an applicator of wood or bone. Green eye paint was most common throughout the ancient world, usually deriving from malachite or atacamite, both containing copper. It also had a medicinal purpose in Pharaonic Egypt, being prescribed for conjunctivitis and other common ocular infections. Kohl lining the rims of the eyes was also considered beneficial, its lead content supporting the body’s immune system against disease, and sooty properties helping to reduce the glare from the relentless sun. Striking eye cosmetics were also considered beautiful, worn by men and women throughout society and buried with the dead for use in the afterlife. 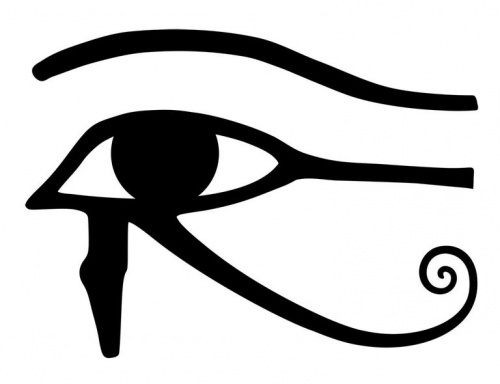 However this was not merely a frivolous concept: Egyptian beliefs were holistic and deeply mystical; painted almond-shaped eyes were believed to ward off evil spirits and may also have symbolised clairvoyance. Many of the ancient and classical civilisations pursued an ideal of physical perfection and had no qualms about using artifice. At the court of the Persian King Darius I (522-486 BC), in present-day Iran, kohl stored in bronze vessels was applied using a slim metal wand. The ancient Greeks used lidded caskets called ‘pyxides’ to store kohl and other beauty preparations; indeed, the word ‘cosmetics’ derives from Greek ‘kosmetikos’ meaning ‘skilled in arranging’ and ‘adornment’. The Romans advanced personal grooming and concepts of beauty, the playwright Plautus (c.254-184 BC) writing: ‘A woman without paint is like food without salt’. Naturalistic paintings on 1st-4th-century Romano-Egyptian mummy cases depict faces with arched black eyebrows and dark outlined eyes. Contemporary texts also infer the use of mica (a soft silicate mineral) in eye powders, for a shimmering effect. When the Romans reached Britain in AD43 the resident Celts were already fond of bold display, the Picts possibly tattooed using copper minerals and Ancient Britons at large decorating themselves using the rich blue dye from the cabbage-like woad plant. In Roman Britain fashionable ladies wore eye-liner and coloured shadows, perhaps ash and powdered saffron, as cited in Ovid’s Ars Amatoria (The Art of Love) in 2 AD. Archaeological evidence for Anglo-Saxon beauty regimes is scarce, but early-medieval writings reveal the popularity of herbal ingredients, especially berry juice, used to darken eyebrows. A 9th-century Irish text describes the feminine ideal: white skin set off by black eyebrows ‘… dark as the back of a stag beetle’ and eyes ‘…blue as a hyacinth’. Striking visions of pale faces and eyebrows dyed ‘blacker than jet’ also feature in early Welsh poetry. The spread of Christianity and emphasis on the state of the soul over the body advocated simplicity over adornment, but the 11th-13th century crusades to the Holy Lands brought Europeans into renewed contact with eastern culture. Knights returned home with exotic beauty preparations, while ladies on crusade, notably Queen Eleanor of Aquitaine and her retinue, observed how local Arab women blackened their eyes with kohl, afterwards introducing kohl into Europe. Medieval ideas about female beauty were expressed verbally and pictorially. One 14th-century author recommended: ‘Look for a woman… whose eyebrows are spaced apart, long and arched in a peak.’ Courtly poetry and portraits idolised a pale, delicate face and high forehead with faint arched eyebrows: eyebrows were plucked to a fine line, using tweezers, the hairline also plucked or shaved. Throughout the 1400s and 1500s high-ranking women could access diverse beauty aids and were expected to enhance their appearance, but without the excessive use of cosmetics denounced as immoral by the Church and popularly associated with prostitutes and courtesans. As cosmetics gradually filtered down through society, beauty became a serious business in Stuart and Georgian England when a person’s looks could win power and status. During the English Civil War a parliamentary bill attempted to suppress ‘…painting, wearing black patches’ and other ‘vices’. Black fabric face patches, fashionable in the 1600s/1700s and shaped as dots, stars and crescents bore provocative names denoting their position: a beauty spot near the eye was a ‘passion.’ Following the Restoration (1660), revived display encouraged a new generation of ‘celebrity’ beauties with vibrant looks. During the 1700s dark eyebrows returned to fashion, berry juice still used for the purpose, or the modern method of shaping and blackening brows with a lead comb. Carbon from smouldering pitch, frankincense, mastic and resin were also mentioned in recipes for darkening eyebrows and the eyelashes - an early form of mascara. Some Georgian ladies (and men) wore artificial brows of silky brown mouse fur: mice were unwelcome visitors in many homes, the hide of a trapped mouse being cut to shape and glued on, close to the natural brow. During the Romantic era, c.1810s-1840s, a fragile, melancholy look was admired, particularly within educated and artistic circles. If all-night reading of Gothic novels and romantic poetry did not produce dramatic dark rings beneath the eyes, a girl might drop belladonna into her eyes. Deriving from deadly nightshade, so-called belladonna (‘beautiful lady’) dilated the pupils, turning eyes into dark, fathomless limpid pools. During the Victorian age of invention and consumerism many traditional beauty products were re-branded, while home-made eye cosmetics were created using ash, elderberry juice and lamp black. In the late-1800s a strong well-defined female face became fashionable and more strident cosmetics were used, such as Fard Italien eyebrow pencils. Actresses gained international fame, like Sarah Bernhardt, whose kohl-lined eyes defined her dusky looks, while Willie Clarkson, theatrical wigmaker and costumier, was among those trialling false eyelashes. Around this time, exotic-sounding eyeshadows like Poudre Circassienne or Fard Indienne became available from Parisian suppliers, while in England Eugène Rimmel pioneered proprietary cosmetics. When his two sons inherited the family business in 1887, they began to develop an extensive colour line, focusing especially on eye-enhancing products. Rimmel’s revolutionary mascara used coal and newly-invented petroleum jelly and, significantly, ‘rimmel’ remains the word for mascara in several languages today. Eye make-up would progress considerably during the 20th century, but in around 1900 a modern woman might use products for darkening her eyebrows and eyelashes, even coloured shadows and perhaps eye liner – all familiar today.